The Prime Minister of Singapore, H.E. 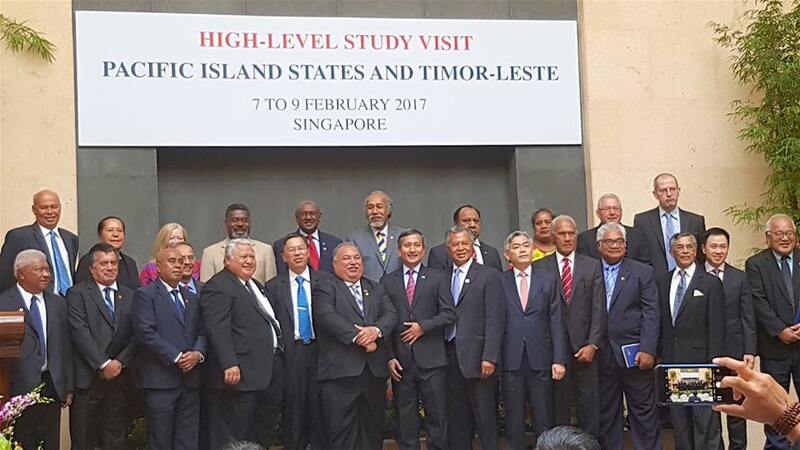 Lee Hsien Loong, has confirmed that he will attend the APEC Papua New Guinea 2018 Leaders’ Summit in Port Moresby next year. The confirmation was given by Singapore’s Prime Minister at a meeting with Papua New Guinea’s Foreign Affairs and Immigration Minister, Hon. Rimbink Pato, in Singapore. “Prime Minister Lee has accepted Prime Minister O’Neill’s invitation and confirmed he will join their counterparts in Port Moresby in November next year, and said he is looking forward to his visit to Papua New Guinea. “Singapore’s Prime Minister has great empathy for the issues on the APEC agenda that are of concern to Pacific Island nations. “There are a number of issues that are of concern to all Pacific Island States, including Climate Change and enhancing connectivity, and Singapore is concerned at how these issues affects our countries. “Extreme weather, made worse by climate change, poses one of the greatest threats to the people and economies of Pacific Island nations. “Singapore has noted concerns, and expressed a willingness to engage through APEC to help mitigate the impacts of climate change on our economies. Foreign Minister Pato said Papua New Guinea and Singapore have a very strong relationship that continues to grow, and a significant amount of APEC travel will come through Singapore. “From October 2017, when Papua New Guinea hosts the APEC Transportation Minister’s Meeting, though to the APEC Leaders’ Summit in November next year, a great deal of international travel will transit through Singapore to Port Moresby. “We look forward to receiving more than fifteen thousand visitors to Papua New Guinea for APEC 2018, and welcoming them on board Air Niugini flights from Singapore." Minister Pato had the meeting with Prime Minister Lee at the conclusion of a High-Level Study Visit for Pacific Island States and Timor-Leste to Singapore last week. “The initiative by Singapore to engage with Pacific Island nations is appreciated and will help address many challenges, particularly those faced by Small Island Developing States. “The forum makes an important contribution to helping Alliance of Small Island States to develop effective internal and external partnerships. “Over the past few days participants were given great insight to the experience Singapore has acquired over a period of fifty years since its Independence. The Minister thanked Singapore for the range of training opportunities that have been offered this year, that he said he will discuss with Departmental officials upon his return to Papua New Guinea. · Tour of the Technical College and with focus specific needs courses offered in conjunction with the Singapore Government's need assessment through relevant government and non-government entities. 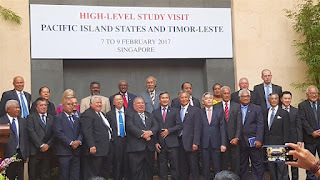 All Pacific Islands States and Timor Leste were represented, including the Prime Ministers of Somoa, Cook Islands, Tonga, President of Naru, and the Foreign Ministers as well as other Ministers from Pacific SIDS Countries. Also in attendance were PIF represented by Dame Meg Taylor, SCREP and PIDF.